Big data analytics is gaining substantial attention due to its innovative contribution to decision making and strategic development across the healthcare field. 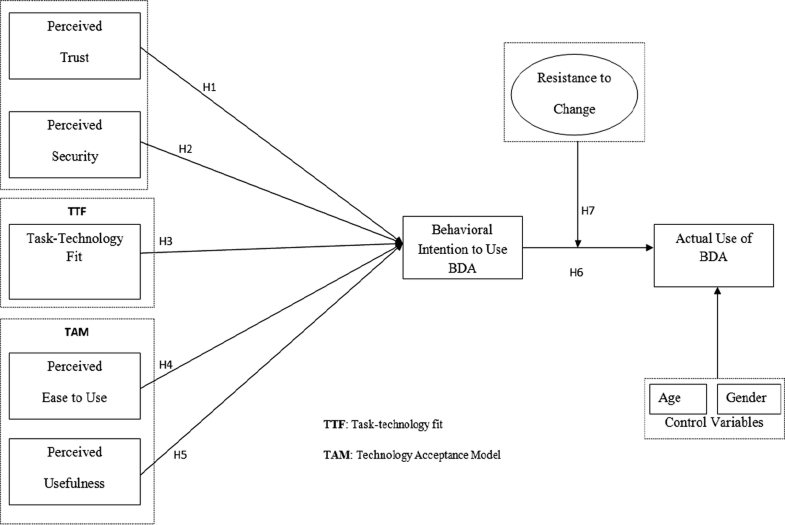 Therefore, this study explored the adoption mechanism of big data analytics in healthcare organizations to inspect elements correlated to behavioral intention using the technology acceptance model and task-technology fit paradigm. Using a survey questionnaire, we analyzed 224 valid responses in AMOS v21 to test the hypotheses. Our results posit that the credentials of the technology acceptance model together with task-technology fit contribute substantially to the enhancement of behavioral intentions to use the big data analytics system in healthcare, ultimately leading towards actual use. Meanwhile, trust in and security of the information system also positively influenced the behavioral intention for use. Employee resistance to change is a key factor underlying failure of the innovative system in organizations and has been proven in this study to negatively moderate the relationship between intention to use and actual use of big data analytics in healthcare. Our results can be implemented by healthcare organizations to develop an understanding of the implementation of big data analytics and to promote psychological empowerment of employees to accept this innovative system. Big data analytics (BDA) is a course of action to examine large and complex data sets (i.e., big data) and select veiled information that can help organizations with efficient decision making . The volume of data related to healthcare organizations has grown dramatically in past years and is expected to increase in coming years due to the use of innovative technologies . Meanwhile, healthcare reimbursement methods are changing, and pay for performance is an emerging factor in the current healthcare environment. Recently, healthcare organizations have only focused on profit and have neglected to acquire the essential tools, infrastructure, and technologies for effective control of big data to ensure citizens’ health care [3, 4]. Big data incorporates features such as variety, velocity, and veracity. BDA techniques can be applied to the massive amount of prevailing patient-related medical information to analyze outcomes for improvement of the healthcare sector [5, 6]. Using BDA in the healthcare sector will help inform each physician of the medical histories of individuals and the population and enable appropriate decision-making regarding treatment of a particular patient . However, compared with the banking and retailing industries, healthcare organizations have lagged behind in the sophisticated use of BDA . The healthcare industry also strives to make internal developments in BDA implementation based on their quality and data performance, which provides timely feedback to interested parties . Therefore, describing the crucial factors that are required for understanding is important prior to creating a strategy for the acceptance of BDA in the healthcare industry, particularly in developing countries such as Pakistan, where the industry requires filling the gap of BDA adoption. Furthermore, data (i.e., big data) related to healthcare are generated at a very high pace , and existing systems are unable to store and analyze the huge volume, velocity and variety of data . Therefore, a need exists for a system with the ability to store and analyze data with high volumes, velocities, and variety, all of which are provided by BDA systems . BDA is in the initial adoption phase, and many healthcare organizations want to implement BDA to obtain its benefits . Thus, a comprehensive adoption model related to BDA is needed to fulfill the existing gap in the literature and help healthcare organizations replace traditional systems incapable of competing with BDA systems. Few studies have described the importance of BDA in healthcare [4, 12, 13], although studies have investigated the technological aspects and required qualifications for big data in healthcare [14–18]. Previous studies focused on technological and policy issues and not on adoption factors, such as security, trust, and fitness of technology for the tasks required to manage BDA in healthcare . According to Dishaw , the technology acceptance model (TAM) and task-technology fit (TTF) provide better outputs than either TAM or TTF alone in the adoption of information technology systems. The prior literature tries to explain BDA adoption through perceptions of technology, such as perceived ease of use and perceived usefulness [20–24]. However, emphasizing only the end user’s perception of technology may not be sufficient. According to Goodhue and Thompson , the TTF model claims that the user will adopt the system when the characteristics of the technology fit the task requirements. Adoption will also occur when the user perceives the technology as useful, easy and advanced, but the technology may not be adopted if a mismatch exists with his required tasks and the technology cannot enhance his job performance [26–29]. Therefore, not only should the user have the perception that the technology is useful and easy but also the technology characteristics should match with the required job tasks. Furthermore, the previous literature showed that perceived security of information [30–32] and perceived trust [33–35] were the biggest hurdles for users adopting innovative information systems. Security of information is the main reason for the slow pace of BDA adoption [36, 37]. Perceived trust is a major concern in the BDA acceptance procedure, and thus organizations should generate more trust in BDA adoption . Prior studies by Malaka, Shin, and Sivarajah [23, 39, 40] also highlighted that perceived security and perceived trust were the biggest challenges and hurdles for BDA acceptance. Resistance to change (RTC) from employees is also a key factor that affects the adoption of different innovative systems, especially in developing countries [41–43]. In previous literature concerning electronic health record system adoption, RTC from physicians was repeatedly reported as a key barrier for system adoption [44, 45], and RTC of employees mitigated the willingness of those who wanted to adopt the system . RTC also resists or slow down the pace of information system acceptance in the health sector [47, 48]. The study considers RTC a key factor in the adoption of BDA in the healthcare sector, which has never been discussed in this scenario. Despite the fame of BDA, insufficient empirical research has investigated factors that can influence BDA adoption in healthcare [21, 49]. Empirical evidence from Pakistan’s healthcare organizations represents a big gap in the literature from both dimensions (i.e., knowledge about BDA and adoption of BDA) . This study summarizes real facts from Pakistan for the healthcare BDA literature. The gap between the potential pros of BDA and the slow and low geared adoption represents a superior opportunity for scholars to realize how BDA can be adopted in the healthcare industry. BDA is in the initial adoption phase in Pakistan, and the government should develop a clear policy and mechanism for the acceptance of BDA in government and the private sector . Therefore, to bridge this gap in the literature, the major focus of this paper is to provide comprehensive research insights into the adoption of BDA in healthcare. To fulfill said gap, the study has two main objectives. The first objective is to help government and private healthcare organizations determine the important factors that play key roles in the adoption of BDA in healthcare in developing countries, such as Pakistan. The second objective is to cover the on-hand gap in the literature concerning the influence of RTC from employees for BDA adoption. 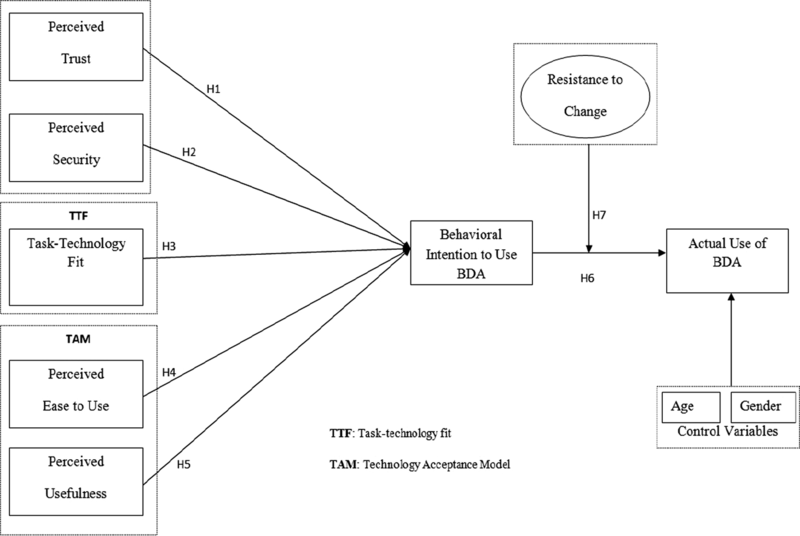 To achieve the above-mentioned objectives, this study incorporated both TAM and TTF models to explain BDA adoption in the healthcare sector from both viewpoints (the user’s perception of technology and the task-technology fitness) with the most important and substantial factors involved in the adoption of information systems (i.e., perceived security and perceived trust). The study also considers RTC as a moderator in the proposed model to address the most important hurdle for developing countries, such as Pakistan [33, 41]. The results justified the use of a composite of both TAM and TTF with security and trust as significant predictors of behavioral intentions (BIs) to adopt BDA, whereas RTC negatively moderated the relationship between BIs and actual use of BDA. In the next section, we describe the theoretical background and develop a research model for this study to analyze the predictors linked to BDA adoption. The research methods are discussed in section three, and section four provides results from our data analysis using structural equation modeling and discussions. “Conclusion” section concludes the overall findings. In addition to the research limitations, our study also has theoretical and practical implications, as discussed in “Conclusion” section. References are given in “Reference” section. During this phase, we underpin the relevant theories and work based on the prior literature regarding the acceptance of a BDA system across various sectors (see Table 1) and produce the research hypotheses for analysis based on the research framework (see Fig. 1). Trust is described as a belief that a person or a particular thing will respond in a helpful way without manipulating the results . Perceived trust is a state of mind in which an individual has acquired assurance and confidence in the information provided by the system . Individual expectations towards technology build trust in its use. Typically, trust in use of technology is used to mitigate the uncertainty of mind when a person lacks experience and knowledge with using innovated technology and information systems . Perceived trust is particularly important in the context of BDA, because adoption of a BDA system is a risk. Many studies have proved that perceived trust is a fundamental reason for the success or failure of information system adoption, including E-payment adoption , online purchasing , adoption of crypto currencies  and internet banking . Trusting BDA is not the only issue, because mistrusting the capabilities of technology to deliver valuable services without interruption and data loss also reduce its adoption intentions . Thus, based on the above cited literature, we assume that perceived trust will also affect BDA adoption. Perceived trust has a significant relationship with BIs to use BDA. Perceived security refers to the degree to which a person believes that use of a specific system is safe and sound for transmitting and recording sensitive information [31, 61]. Perceived security of information is an important concern for healthcare, which contains sensitive patient information . Perceived security is the factor that restricts user thinking about the benefits of a system and convinces him to use a system that is negatively perceived . In the previous literature, many studies described the value of perceived security for the adoption of different analytical information systems (i.e., cloud computing , B2C electronic commerce , online markets , and electronic health record systems ). The use of BDA systems has some reservations in the minds of users regarding information security in the form of informational fraud, misuse of sensitive information and use by various unconcerned departments [71, 72]. Prior literature on BDA and its adoption has not emphasized security of information sufficiently [72, 73]. Based on the prior literature, one key feature that can affect BDA adoption by healthcare organizations is the security of the analytical tools used to generate useful information. Employees’ perceptions of the security level of technology possibly affect its adoption rate. Organizations that have high-level capabilities for dealing with information security will possibly develop the intention to use BDA. Perceived security has a significant relationship with BIs to use BDA. The effective adoption of an information system relies on identification of the task for which the technology is used and whether a suitable match exists between the task and technology. As described by Goodhue , decomposition of TTF investigates the user’s requirements for the information system, which ultimately impact the individual performance. The study of Lin and Huang  defines the task as activities performed to create valued outputs that satisfy human wants. Technology refers to the combination of various supportive activities to perform such tasks (i.e., computers, software, and others). Prior studies by Benford, D’Ambra and Khan et al. [50, 75] described the various dimensions of tasks (e.g., nonroutines, interdependence, data access, and quantitative data analysis), which were related to several technical aspects that fulfilled individuals’ needs. Task and technology both have significant impacts on the ability of TTF to estimate users’ performances from several perspectives . Innovative information technology and the system will be useless if they fail to satisfy individual requirements for performance of a specific task . Therefore, recognizing the task-technology fit of a BDA system is significant, because it leads towards adoption of the system by healthcare organizations. Prior studies discussed TTF in several aspects to determine the user task fitness for technology and group decision making, which led towards the successful adoption of an information system in various organizational settings (i.e., massive open online courses [MOOCs] , E-commerce , electronic health records , group decision support systems , high-speed data services , and mobile banking ). Therefore, based on the abovementioned literature, we believe that successful adoption of BDA by healthcare organizations significantly depends on matching of technology with the user task requirements, which has not been studied by prior researchers. The study of Zhou et al. designed a TTF measure that could evaluate the fit between task and technology , with no need to evaluate the impact of the task and technology characteristics on TTF. Therefore, we use only TTF as used by Klopping and Qiwei [78, 79], and we use the task and technology characteristics separately. TTF has a significant relationship with BIs to use BDA. This paper applied the TAM to observe the adoption of BDA because it satisfactorily determined users’ perceptions of the ease of use and usefulness of a new system . TAM model determinants are optimal for determining user perceptions about its adoption . TAM has been adopted by many researchers to successfully check and manage new system adoptions [54, 57, 83, 84]. Since the invention of TAM, an abundance of studies have produced different research models to effectively predict user attitudes and behavioral intentions towards technology adoption. Interestingly, all of these studies used approximately similar attributes to evaluate technology adoption . Many studies have concluded that TAM is one of the best models in different contexts (e.g., forecasting general buyer behavioral intentions , telemedicine adoption  and radio frequency identification (RFID) integrated system adoption ). Previous literature has witnessed the adoption of innovations with massive implementation of TAM in the evaluation of user intentions regarding new technology diffusion . The literature widely backs the use of TAM constructs [i.e., perceived usefulness (PU) and perceived ease of use (PEOU)] in measuring adoption solutions for new technology [24, 39, 89, 90]. The study proposes that TAM will provide superior understanding of BDA adoption, because BDA is a heavily technology-driven research area that is also user-oriented and innovation-focused . Previous studies by Esteves, Rahman, and Shin [21, 23, 91] also concluded that TAM constructs (i.e., PEOU and PU) were significant predictors of BDA adoption/usage. The study of Davis  defined PEOU as the degree of ease involved when using an information system. Subsequently, Soon  clarified that ease in using the information system and technology would help enhance its acceptability among users. The use of an effortless system will help enhance individual and organizational performances [24, 92]. BDA potentially generates benefits for organizations, including cutting costs, controlling risk factors and helping with efficient decision making. Adoption of BDA depends on user considerations in terms of its convenience of use, which employs processing of large-scale and heterogeneous data . However, the intensity of difficulty and ease of using BDA vary from person to person. The prior literature has proven the existence of a significant direct relationship between the PEOU and a user’s intentional behavior to adopt the system in various fields of study [54, 93, 94]; this relationship was also discussed by Esteves, Shin, and Weerakkody [21, 23, 39] when studying user intentional behaviors regarding the adoption of big data, although these studies were less focused on this study context. For example, measuring the relationship of PEOU with the intention to use BDA is essential for healthcare organizations. The idea of BDA is not much older and can create much confusion in the user’s mind about its ease of use, which may decrease user intentions towards its use in healthcare organizations. Based on the aforesaid opinion, we propose the following hypothesis. PEOU has a significant relationship with BIs to use BDA. PU can be defined as whether an individual considers that their job performance will be improved by using the system [24, 82]. PU is the most commonly used variable and the primary driver of technology adoption [92, 95]; PU is also expected to be the primary driver of intention to use BDA in healthcare in this study. PU is an essential variable for studies of the adoption intentions of innovation from the user’s perspective . The previous literature has provided evidence of a positive relationship with intention to use many times, which has been successfully measured in various fields [26, 54, 94], including the field of big data [21, 23, 57], but BDA not has not been a focus in healthcare. The user cannot shape a positive perception of usefulness until he or she feels any practical worth of BDA in healthcare organizations. According to the theoretical principle of the TAM model, the study hypothesized that PU had a positive relationship with BIs. PU has a significant relationship with BIs to use BDA. A BI is an intention to achieve some specified future behavior  and is a key predictor of an individual’s actual use of technology [96, 97]. BI is an essential first step towards actual adoption of any system . According to Venkatesh and Davis , BI was an important mediator in the relationship between predictors and specific system adoption. The prior literature has proven that a person is more likely to adopt a technology if he has an intention to use it . The social sciences literature has provided evidence that BIs have a direct impact on actual use [77, 82], and various studies have concluded that BIs have a significant influence on adoption of BDA [21, 23]. This study suggests that individuals with the intention to use BDA will lead to the actual use of BDA. BIs have a significant relationship with actual use of BDA. According to French , change is a state in which differences exist between new and old ways of thinking. The behavior of individuals who protects them from the consequences of either real or imagined change is called RTC . Oliver  defines RTC as protection of the status quo via individuals creating resistance against the innovative system. Every innovative system is commonly a source of panic and bears RTC due to its perception as a possible threat to the solidity of old habits [43, 101]. To avoid RTC in organizations when implementing new systems or ways of working, Oreg  proposed that the organization should encourage employees to learn new skills, tasks, and programs. One aspect of personality is that RTC is very important for technology adoption . The previous literature has shown that RTC is a demotivator and negatively influences the acceptance of information technology [104–106]. The study of Alomari  concluded that RTC was one factor that caused non-adoption and failure of new information systems. Lallmahomed et al. investigated the adoption behavior of an e-government system by focusing on RTC and established a significant negative relationship between RTC and adoption of the system. Many other researchers also proved the importance and negative associations of RTC with acceptance of information and communication technology systems [42, 43, 108]. A study of green supply chain management (GSCM) adoption  investigated RTC as a moderator between BIs and adoption of GSCM and concluded that higher RTC among employees would lead to non-implementation of GSCM. Similarly, Bral III et al. investigated the moderating role of RTC between psychological capital and organizational citizenship behavior. Regarding BDA in healthcare organizations, RTC is likely to moderate between intentional behaviors and actual usage of the BDA system by employees. The previous literature also reported that RTC either did not significantly affect or had a minor direct impact on the actual use of technology [41, 109]. Therefore, this study also focuses on the moderating role of RTC rather than on the direct influence of RTC on actual use. RTC moderates the relationship between BIs to use and actual use of BDA. Here, the researchers describe the methodology followed by this study. Figure 2 represents the flow diagram of the research progress. In this study, we adopted all of the measures from previous studies with the same context to preserve the content validity. All constructs were measured on a 7-point Likert scale in which the agreement of the participants to a given statement was assigned a score ranging from 1 (strongly disagree) to 7 (strongly agree). The 3-item perceived trust scale was adapted from , the four-item perceived security scale was adapted from , and the three-item task-technology fit scale was adapted from [27, 74]. Similarly, the three-item scales for both PU and PEOU were adapted from . The three-item scale for BI to use was adapted from , and the three-item scale for actual use was adapted from . The four-item scale for RTC was adapted from . The structured questionnaire-based survey method was used in this empirical study to measure the proposed model. The survey method is helpful for measurement of behaviors and the relationships among constructs . Typically, the survey method has been used in previous studies in which researchers assess adoption or user intention-behavior . First, a pilot study was conducted with 20 prospective users of the BDA system. The results of the pilot study were discussed with four senior professors with great command of construct building, and then the measurement items were refined based on the discussions, which also confirmed the face validity of the measurement scale. All prospective BDA system end users from 25 hospitals in four big cities of Punjab Pakistan (Lahore, Faisalabad, Rawalpindi, and Multan) and the Islamabad capital territory of Pakistan were selected for data collection using a convenience sampling technique. A convenience sampling technique is a suitable sampling technique by virtue of the accessibility of the researcher to the participants . A refined questionnaire with a cover letter that assured the respondents that the data would be used only for academic research purposes and kept confidential was distributed to all participants through an online survey. The online survey ensures research consistency with data collection . A total of 400 questionnaires were distributed among the participants, and 260 filled questionnaires were received, of which 36 questionnaires that contained missing values or biased responses were not included in the study. The remaining 224 responses were selected for the analysis. Furthermore, the study considered age and gender as control variables to ensure that the results of the model were not influenced adversely by covariance, because the previous literature suggested that age and gender might influence the intention to use [63, 118]. We employed structural equation modeling (SEM) using the IBM-AMOS (v21) software to evaluate the proposed research model. It is evident from the previous literature that the AMOS software is a powerful tool for performing confirmatory factor analysis (CFA) and SEM . AMOS is also a complete package for evaluation of formative measures and moderating relationships . Because AMOS is user-friendly and provides a graphical interface that enables easier handling, we used this software for the CFA and SEM and SPSS (v 21) to measure the validity and reliability and conduct an exploratory factor analysis (EFA) prior to the CFA and SEM. We also used SPSS for the demographic statistics. Table 2 presents the demographic information for the respondents, of whom 128 out of 224 were male, 82% were in the age bracket of 25–45 years, and 98% had a bachelor’s or higher degree; the remaining 2% had a high school certificate or relevant diploma as well as knowledge and experience with using technological systems. Kaiser–Meyer–Olkin (KMO) and Bartlett’s test of sphericity were used to measure sample adequacy . The KMO value was 0.857, which was within the cutoff range of 0.8–1 that showed sample adequacy. Data were collected without regard to differences in time; we checked the common method bias (CMB) in the data using Harman’s single-factor test . After categorizing the items into eight subgroups, the results indicated that the first factor explained 31.1% of the variance, which was below the 40% cutoff rate. Thus, CMB is not an issue in the study. Prior to the path analysis, the reliability and validity were measured. The value of Cronbach’s alpha was greater than 0.7 for all factors. The composite reliability (CR) and AVE values ranged from 0.847 to 0.962 and from 0.652 to 0.864, respectively, which were within the accepted ranges [123, 124]. Table 3 shows all of the Cronbach’s alpha, CR and AVE values. Table 4 proves that no issue existed with the discriminant validity of the constructs in the study, because the square root of AVE was higher than all inter-construct correlations . The study conducted EFA using SPSS to ensure that the measures in the study were correct with respect to the concerned variables. The factor loading values shown in Table 3 ranged from 0.744 to 0.953, which proved that no issue existed regarding cross loading of the constructs . CFA was conducted through AMOS to check the consistency and validity of the constructs for the proposed study framework. The CFA values are CMIN/DF = 1.545, root mean square error of approximation (RMSEA) = 0.049 with a PCLOSE value of 0.529, comparative fit index (CFI) = 0.967 and Tucker-Lewis fit index (TLI) = 0.960. All values are in accordance with the threshold values . These results proved the good fitness of the model. The above results proved good fitness of the model and that the data were highly reliable and valid. Therefore, we continued with the path analysis. In the path analysis, CMIN/DF = 1.748, RMSEA = 0.058 with a PCLOSE value of 0.278, CFI = 0.939, and TLI = 0.901, which proved that the model was a good fit. Then, the study measured the path coefficients and found that all coefficients were significant. The results shown in Fig. 3 demonstrate that perceived trust (β = 0.124, p < 0.05), perceived security (β = 0.209, p < 0.001), TTF (β = 0.263, p < 0.001), PEOU (β = 0.240, p < 0.001), and PU (β = 0.118, p < 0.05) have significant positive relationships with BIs to use BDA. Thus, H1, H2, H3, H4, and H5 are supported. In addition, BIs to use BDA (β = 0.412, p < 0.001) have a significant positive relationship with the actual use of BDA, and thus H6 is also accepted. The model also demonstrates that 45% of the variance exists in the BIs to use BDA and 25% of the variance represents the actual use of BDA. The control variables age and gender did not have a significant relationship with the actual use of BDA. Therefore, we concluded that the hypothesized study model was accepted. The study proved that RTC moderated the relationship between BIs to use the BDA system and actual use of the BDA system. The interaction term (behavioral intentions to use × resistance to change) (β = − 0.201, p < 0.001) had a significant and negative effect on the actual use of the BDA system. Thus, a higher RTC weakened the relationship between BIs to use and actual use of the BDA system, which accepted H7. BDA change the decision-making style in the healthcare sector. An interactive and task-oriented system can make possible use of BDA in any sector, especially in healthcare organizations. With these objectives in mind, this study provided useful findings and a framework for practical adoption of BDA systems and future research. The study focused on security and trust of information, which were observed to be big concerns of system users. Similar to the results of , perceived trust and perceived security had a positive effect on BIs to adopt BDA. 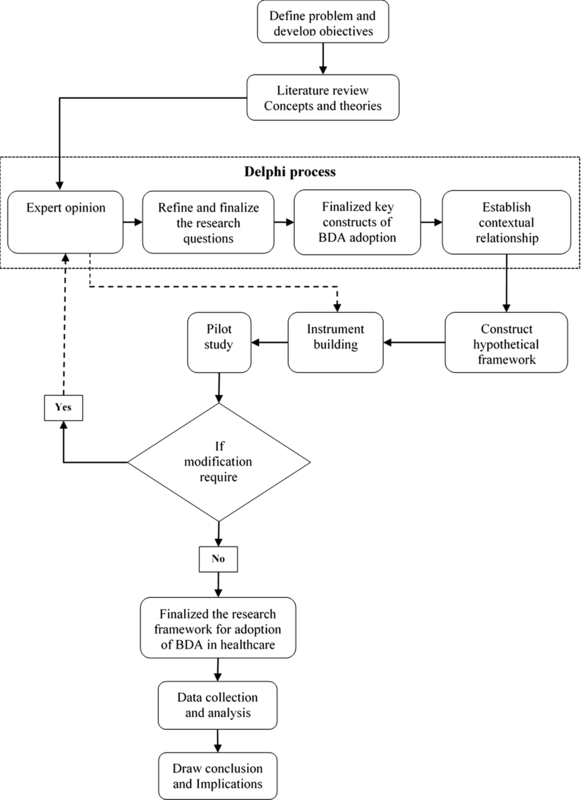 The study also investigated TTF, which had a positive impact on the behavioral intentions to adopt BDA, indicating that features of the system must be matched to the specific task of the user for successful adoption of a BDA system. Our results are consistent with the results of Afshan and Brock . Similar to previous studies by Shin and Soon et al. concerning BDA adoption, this study also demonstrated the positive effects of PEOU and PU on BIs to adopt BDA, which suggested that the system should be easy to use and have attractive features that make it look useful to the user. Furthermore, the study investigated RTC in employees, which played a key role in the convergence of BIs to put the system into actual use. The results of this study illustrate that as RTC from employees increases, actual use of BDA systems will decrease. The RTC result is consistent with that of Beal III and Nejati [41, 109]. The adoption of BDA is in the initial stage, in which many healthcare organizations are thinking about adopting BDA systems. The present is an optimal time to adopt/implement BDA systems, especially in healthcare organizations, with an aim of providing better healthcare facilities by maintaining patients’ health records and formulating better strategies. This study contributes to the literature by showing the main factors that are important when adopting the BDA system. This study results are also imperative for strategy makers who want to implement a BDA system by demonstrating factors that are important initially. In contrast to existing studies, this study also expressed the huge positive combined effect of the TTF and TAM theories on behavioral intentions to adopt BDA. Combining TAM and TTF gives more effective results than use of TAM or TTF individually [19, 26]. The prior literature demonstrates use of the TAM model alone in the adoption of a BDA system. The current study also incorporated important concerns from users regarding adoption of any innovative system, such as perceived security and perceived trust. These factors provide an additional significant aspect to the literature regarding BDA. Our sampling territory is Pakistan, which is a developing country. RTC is the largest barrier in the adoption of innovative systems, particularly in developing countries but also in developed countries. According to our best information, this study is the first to enrich the literature by linking resistance to change of employees with BDA adoption as a moderator. This moderation result will help implementers control this factor at the time of adopting the BDA system. This study contributes noteworthy research insights into BDA system implementation. The study fills the main gap in the literature concerning the empirical evidence for BDA in Pakistani healthcare organizations for the first time. Second, the majority of previous studies only highlighted the importance, challenges, and opportunities of BDA, because BDA was in the initial stage of adoption and was a comparatively new topic. Second, few researchers have investigated the adoption of BDA, and the existing studies have focused on a specific perspective (i.e., an economic or financial perspective) or have simply emphasized TAM theory. This study is probably the first on BDA adoption to propose a model that combines the TAM and TTF theories as predictors of behavioral intentions to use BDA. Thus, integration and implementation of the TAM theory with the TTF theory for BDA adoption is a new perspective that enhances the literature. Second, to switch from the previous healthcare system to a BDA system, the literature needs a strong theoretical basis for further research and a broad and general research model that is not specific to one aspect of the business. This study model will be helpful and will advance a theory for future BDA research. Furthermore, the study included security and trust aspects of information in the model to elucidate their impacts on BI. Our results will contribute to the security and trust perspectives in the technology acceptance literature and provide security and trust grounds for further research. In addition, the results obtained for resistance to change represent an immense theoretical contribution for researchers, because the current study has highlighted this important barrier in the implementation of BDA. This investigation can be used as a reference for future research and to increase understanding of the adoption of BDA research. The study also contributed practically in several ways similar to its theoretical contributions. The findings of the study propose salient guidelines and important implications for practitioners and implementers of BDA systems that can assist with successful adoption of BDA systems. First, connecting system functions with the required tasks of the organization as well as the PU and PEOU of the system are important. This approach will provide results that are more fruitful for practitioners when implementing BDA systems. Second, the findings of the study also indicate that perceived security and perceived trust are the key predictors of intentions regarding acceptance of a BDA system. Third, this study explores the moderating effect of RTC, which reduces the adoption of BDA systems in developing countries. This study will provide broad insights for implementers of BDA systems in developing countries and allow the design of strategies to ultimately reduce employees’ resistance levels. Finally, this study provides an initial platform for practitioners for adoption and promotion of BDA practices within the organization to obtain maximum advantages of innovative technology, especially in developing countries. The authors acknowledge some limitations of the current study. First, the focus of this study is on healthcare organizations in Pakistan regarding adoption of a BDA system. The impact of organizational culture was ignored by this study, which might have an effect on the level of adoption of this system. Future researchers may test the same research model in other organizations considering different cultural setups, because the organizational setup and culture vary from industry to industry; therefore, the findings of this study may vary when applied to different sector organizations. This study provided understanding of BDA system adoption in developing countries in particular and developed countries in general. Thus, future researchers can test this model in developed countries to increase the generalization of the study, because the severity of resistance to change from employees is greater in developing than in developed countries . The research model can be tested in different cultural settings with a focus on adoption of BDA systems. This study was aimed to investigate the user adoption factors of BDA, which neglect the other side of system implementation. Therefore, future researchers can identify the developers/architects intentions for development and implementation of BDA system. Finally, this study was based on cross-sectional settings, which restricted measurement of the consistency in respondent behavior; this gap should be tested in a longitudinal setup to improve the significant contribution to knowledge. MS conceptualized the idea, prepared the literature and build theory, designed research framework and collect data, analyzed results, drafted and proof-read the manuscript, GCY and ZL provided supervision and guide throughout the process. FS and YH contribute in analysis and results writing. All authors read and approved the final manuscript. This study has been supported by “National Natural Science Foundation of China (NSFC)” Grant Numbers: 71774044, 71672050, and 71272191. Data can be available on demand. We, the authors, consent to the publication of this manuscript in the Journal of Big Data. Nannetti P. The deciding factor : big data & decision making. Capgemini Consulting Technology outsourcing. 2012;1–5. https://www.capgemini.com/resources/the-deciding-factor-big-data-decision-making/. Maria VMF. Big data services based on mobile data and their strategic importance. In: 7th International Conference on Computers Communications and Control. 2018;276–81. http://ieeexplore.ieee.org/lpdocs/epic03/wrapper.htm?arnumber=6758026. Esteves J, Curto J. A risk and benefits behavioral model to assess intentions to adopt big data. J Intell Stud Bus. 2013;3:37–46. https://www.scopus.com/inward/record.uri?eid=2-s2.0-84905689717&partnerID=40&md5=532714767e19a3335cb1ef08de04d66c. Rahman N. Factors affecting big data technology adoption. Student Res Symp 2016. 2016;0–29. http://pdxscholar.library.pdx.edu/studentsymposium%5Cn, http://pdxscholar.library.pdx.edu/studentsymposium/2016/Presentations/10. Goodhue DL, Thompson RL. Task-technology fit and individual performance. MIS Q. 1995;19:213. http://www.jstor.org/stable/249689?origin=crossref. Junglas IA, Watson RT. Location-based services. Commun ACM. 2008;51:65–9. http://portal.acm.org/citation.cfm?doid=1325555.1325568. Lee C-C, Cheng HK, Cheng H-H, Cheng HK. An empirical study of mobile commerce in insurance industry: task–technology fit and individual differences. Decis Support Syst. 2007;43:95–110. www.elsevier.com/locate/dss. Liao C, Liu C-C, Chen K. Examining the impact of privacy, trust and risk perceptions beyond monetary transactions: An integrated model. Electron Commer Res Appl. 2011;10:702–15. http://linkinghub.elsevier.com/retrieve/pii/S1567422311000408. Lorenzi NM, Kouroubali A, Detmer DE, Bloomrosen M. How to successfully select and implement electronic health records. BMC Med Inform Decis Mak. 2009;9:15. http://uvic.summon.serialssolutions.com/2.0.0/link/0/eLvHCXMwY2BQsEg1TgWd_JSaZGGWbJ6anGhgnmRqap5qamJmYpgE3iCG2DqGVJq7CTEwpeaJMsi6uYY4e-iCSsj4AsiZC_GgU1yAlY2FoYEYA28iaPF3Xgl4k1gKAK4dG90. Groves P, Kayyali B, Knott D, Van Kuiken S. The “big data” revolution in healthcare: accelerating value and innovation. McKinsey Glob Inst. 2013;1–22. http://www.images-et-reseaux.com/sites/default/files/medias/blog/2013/12/mckinsey_131204_-_the_big_data_revolution_in_healthcare.pdf. Mahmood T, Afzal U. Security analytics: big data analytics for cybersecurity. In: 2013 2nd national conference on Information assurance (ncia). 2013;129–34. http://ieeexplore.ieee.org/stamp/stamp.jsp?arnumber=6725337. Memon MA, Soomro S, Jumani AK, Kartio MA. Big data analytics and its applications. Ann Emerg Technol Comput. 2017;1. www.aetic.theiaer.org. Pavlou PA, Fygenson M. Understanding and prediction electronic commerce adoption: an extension of the theory of planned behavior. MIS Q. 2006;30:115–43. http://search.ebscohost.com/login.aspx?direct=true&db=buh&AN=19754863&site=ehost-live%0A, http://www.jstor.org/stable/25148720. Fang Y, Qureshi I, Sun H, McCole P, Ramsey E, Lim KH. Trust, satisfaction, and online repurchase intention: the moderating role of perceived effectiveness of e-commerce institutional mechanisms. MIS Q. 2014;38:407–27. https://misq.org/trust-satisfaction-and-online-repurchase-intention-the-moderating-role-of-perceived-effectiveness-of-e-commerce-institutional-mechanisms.html. Shahzad F, Xiu GY, Wang J, Shahbaz M. An empirical investigation on the adoption of cryptocurrencies among the people of mainland China. Technol Soc. 2018. http://www.sciencedirect.com/science/article/pii/S0160791X18300204. Alkhater N, Walters R, Wills G. An empirical study of factors influencing cloud adoption among private sector organisations. Telemat Inform. 2018;35:38–54. http://linkinghub.elsevier.com/retrieve/pii/S0736585317303088. Ackermann T, Widjaja T, Benlian A, Buxmann P. Perceived IT security risks of cloud computing: conceptualization and scale development. ICIS. 2012;1–20. http://aisel.aisnet.org/icis2012/proceedings/ISSecurity/3/. Ferguson AG. Policing predictive policing. Wash Univ Law Rev. 2017;211–68. https://papers.ssrn.com/sol3/papers.cfm?abstract_id=2765525. Gan Q, Cao Q. Adoption of electronic health record system: multiple theoretical perspectives. In: 2014 47th Hawaii International Conference on System Sciences (HICSS). 2014;2716–24. http://ieeexplore.ieee.org/document/6758942/. Dennis AR, Wixom BH, Vandenberg RJ. Understanding fit and appropriation effects in group support systems via meta-analysis understanding fit and appropriation effects in group support systems via meta-analysis. Source MIS Q MIS Q. 2001;25:167–93. http://www.jstor.org/stable/3250928%5Cn, http://about.jstor.org/terms. Davis FD. Perceived usefulness, perceived ease of use, and user acceptance of information technology. MIS Q. 1989;13:319. http://www.jstor.org/stable/249008?origin=crossref. Dillon A, Morris MG. User acceptance of new information technology: theories and models. Annu Rev Inf Sci Technol. 1996;31:3–32. http://arizona.openrepository.com/arizona/handle/10150/105584. Prieto JCS, Migueláñez SO, García-Peñalvo FJ. ICTs integration in education: mobile learning and the technology acceptance model (TAM). In: Proceedings of the second international conference on technological ecosystems for enhancing multiculturality. 2014;683–7. https://doi.org/10.1145/2669711.2669974. Rahman N. Factors affecting big data technology adoption Nayem Rahman department of engineering and technology. In: Student Res Symp Pap 10. 2016;0–29. http://pdxscholar.library.pdx.edu/studentsymposium/2016/Presentations/10. Ibrahim R, Leng NS, Yusoff RCM, Samy GN, Masrom S, Rizman ZI. E-learning acceptance based on technology acceptance model (TAM). J Fundam Appl Sci. 2017;9:871. https://www.ajol.info/index.php/jfas/article/view/165451. French WL. CHB. Organization development: behavioral science interventions for organization improvement. 6th ed. Upper Saddle River: Prentice Hall; 1999. http://ezproxy.yorksj.ac.uk/login?url=, http://search.ebscohost.com/login.aspx?direct=true&db=edb&AN=6266511&site=eds-live&scope=site. Zander A. 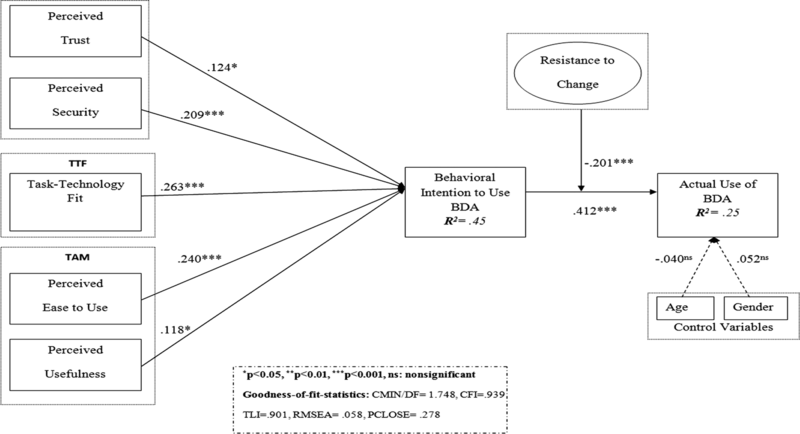 Resistance to change—its analysis and prevention. Adv Manag J. 1950;15:9–11. http://psycnet.apa.org/psycinfo/1950-06096-001. Kim H-W, Kankanhalli A. Investigating user resistance to information systems implementation: a status quo bias perspective. MIS Q. 2009;33:567–82. http://www.jstor.org/stable/20650309. Beal III L, Stavros JM, Cole ML. Effect of psychological capital and resistance to change on organisational citizenship behaviour. SA J Ind Psychol. 2013;39. http://sajip.co.za/index.php/sajip/article/view/1136. Saunders M, Lewis P, Thornhill A. Research methods for business students. Res methods Bus students. 2016;649. http://lib.myilibrary.com/Open.aspx?id=819487#. Byrne BM. Structural equation modeling with AMOS: basics concepts, applications, and programming. Struct Equ Model. 2016. http://www.uta.fi/aktkk/lectures/sem_en/pdf/sem_exercise_v2.4.pdf. Von Der Heidt T, Scott D. Rethinking the role of external collaboration in product innovation. Int J Entrep Innov Manag. 2012;15:59–90. http://www.scopus.com/inward/record.url?eid=2-s2.0-84857306847&partnerID=40&md5=66b5e12dd28c6ccf46ea9bca98bfbe54. Bartlett MS. A note on the multiplying factors for various X2 approximations. J R Stat Soc. 1954;16:296–8. http://www.jstor.org/stable/2984057.